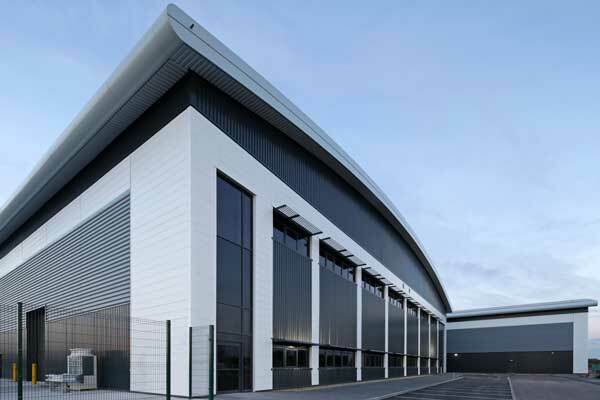 Located just south of Burton-upon-Trent, developer St. Modwen has completed phase two of its Burton Gateway distribution park. Phase two consists of three distribution centres, two of which are combined within one large structure, totalling more than 11,000m² of space. Main contractor GMI started on-site in Spring 2018 and ASA Steel Structures fabricated, supplied and erected the steelwork. The site is said to be one of the largest warehouse developments in the Midlands and is a key employment site for East Staffordshire. It is already home to Hellmann Worldwide Logistics, who last year took a 10-year lease on a speculatively developed 8,000m² building on the site. In order to develop the 280-acre site, St. Modwen carried out extensive highway works to support the regeneration of the area and, in turn, unlock the potential of a key location for commercial and residential development, having worked with the local authority and stakeholders. St. Modwen has also recently secured planning consent for the third phase of construction at Burton Gateway, totalling a further 9,600m² of distribution space.